Our LifeGard aluminum fence is 4ft high and perfect for swimming pools, as it meets BOCA pool code regulations. The LifeGard style features a flat top and bottom rail. 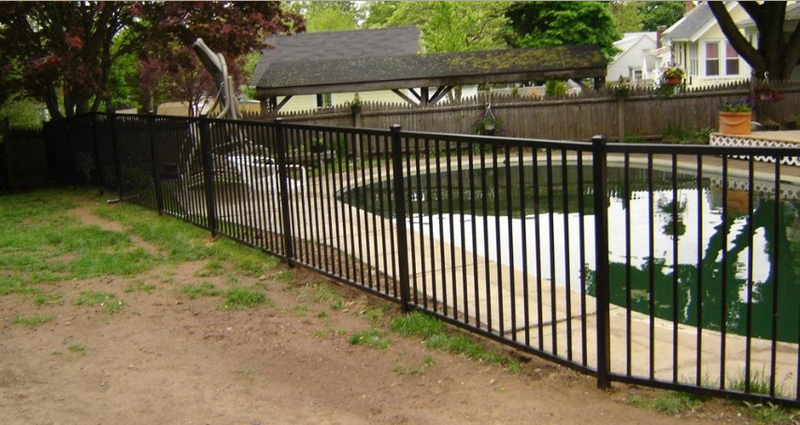 Built out of strong high quality aluminum, given a thorough powder coated finish, and including a lifetime limited warranty - this is absolutely the best solution for fencing in any pool. Every gate in the LifeGard style even comes with MagnaLatch and TruClose hinges. We have great news about your new Elite aluminum fence. We ship every Elite section in completely pre-assembled fence panels, meaning you can spend less time installing your fence and more time enjoying the pool! While most Elite aluminum fence styles allow you to choose whether you want a picket through or no picket through bottom, LifeGard is the pool fence, so it is only available in the BOCA pool code approved no picket through bottom. Gates are also available in the BOCA pool code approved LifeGard fence style. Every LifeGard aluminum gate includes a MagnaLatch and TruClose hinges, making it truly pool friendly. Have questions before purchasing your perfect pool fence or wish to complete your purchase over the phone? At Discount Fence Supply we're commited to being there for you every step of your fence shopping experience. You can reach our friendly representatives toll free Monday thru Friday 8-5 EST at (800) 878-7829, or you drop us an email us anytime at sales@discountfence.com. We're here for you! Copyright © 2015 Discount Fence Supply, Inc. All Rights Reserved.